Airmen can resort to drastic measures to meet the service’s waist measurement requirements because exceeding the limit by just half an inch can cause them to be reprimanded, demoted or even kicked out of the service. 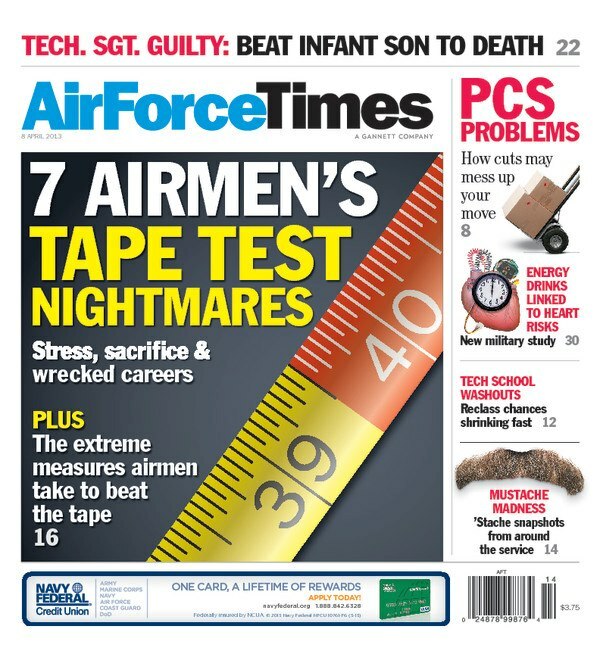 In this week’s Air Force Times, airmen tell their stories about what they’ve put themselves through to meet waist measurement requirements, including severely dehydrating themselves and slathering themselves in hemorrhoid cream. In other news: A tech. sergeant has been convicted for the death of his 7-week-old son, part of an alarming increase in the deaths of children under the care of airmen. Read what the warning signs are of a child being abused or neglected and what you should do if you suspect someone is mistreating a child. Meanwhile, the spending measure that funds the government through the rest of fiscal 2013 could leave the Air Force $100 million in the hole for aircraft it doesn’t want. The measure requires the Air Force to keep buying Block 30 Global Hawks and continue flying C-27J Spartans, both of which the service wants to divest in order to save money. Also this week, read how 21 Medal of Honor recipients from World War II, Korea, Vietnam and Iraq attended this year’s National Medal of Honor day ceremonies at Arlington National Cemetery. And we have a full page of airmen showing off their facial hair in new and creative ways for “Mustache March,” the annual “protest” against the Air Force’s regulations on looking squared away.